Here are the contributions linked up this week. The are all so good!!! Be sure to link up any day next week on any of my posts to be included next week. Please visit the following links to get in the mood for Halloween. The house on Montague Street was always empty except for the last two weeks of October, when suddenly the house sprang to life. Every night, a new jack-o-lantern would appear in one of the dusty windows, and stare out at the town grinning its toothsome grin. The children on Montague Street looked forward to Hallowe’en more than any child anywhere else in the world – because the man who lived at that great old house atop the only hill in town loved Hallowe’en more than anyone who ever lived. No adult in town would ever talk about it, because they’d been children once, and they remembered their promise to the old man – who was old even when they were children, and who must be absolutely ancient now. They had all promised to keep his magic a secret, and especially the price of the magic. William Doucette, however, hated the house, the man, and Hallowe’en altogether. He’d lived there all his life, and he never went up to the house on the hill. He heard stories about the parties that went on there on Hallowe’en night. Every November 1st, he’d endured the laughter and lies of his schoolmates as they regaled him with stories of ghosts and ghouls and monsters and demons, all come to life, and dancing in the moonlight at the old man’s house. He knew they were making fun of him – they never invited him to their parties, they picked him last for all their games, and they certainly never invited him to come trick-or-treating with them. William decided that this year was going to be different. This year, he was going to march right up to the old house atop the hill, and knock on the door himself, and tell the old man exactly what he thought of him. He marched through the darkness, following the glow of the many jack-o-lanterns, and passed the mailbox that read Mr. Aos Sí. He could hear peals of laughter and shouts of fright coming from the usually empty house, and he had to knock very loudly in order to be heard. A spry looking man answered the door with a devilish grin. William looked around the room and saw a host of strange looking creatures staring at him, and he could swear they looked hungry. Neighbourhood children in various costumes were dancing among them merrily. The door closed behind William, and the screams began. The magic would continue for another night. It’s reblog, Sunday! 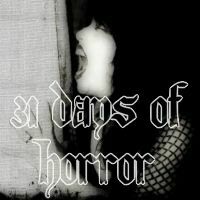 Don’t miss all of the stories that have been submitted to Hasty’s 31 days of horror going on the entire month of October. She will link up all the stories that have been linked every Sunday. Ohhhhhhh I can do OctPoWriMo AND THIS! *squeeee* Do I just post a link in the comments here for the day I join in? Hi! Thank you for including my short story in the link. I’m glad you enjoyed it. Is it okay if I enter another story next week? Gut-wrenching… now come on… do something for my art contest… pleeeeeeeeeeaaaaaaaaaaaaaaassseeeeeeeeeeeeeeeeee… for me……………. Love this idea Hasty! Working on something for this week to link up next Sunday! Clever idea. I enjoy a horror story.